The cameleon-nano family achieves greater apparent calcium affinity than YC2.60-4.60, reaching levels of up to 15nM. They did this by increasing the flexibility of the linker by extending the standard Tsien/Miyawaki/Baird Gly-Gly-Ser linker with additional glycines. In this case, the longer the linker between the CaM and M13 segments, the greater the apparent affinity. Interestingly, improvement by increasing linker flexibility is precisely the opposite the advice Atsushi and Take gave me for achieving high ratio changes with FRET reporters. Back at RIKEN in 2002, they suggested I use short, stiff linkers to restrict the rotational freedom of the fluorescent pairs. Then one could find orientations where relative rotation of dipole moment gave much greater FRET changes than would be expected from changes in FP distance alone. Take and Atsushi’s big YC2.60/3.60 paper strongly supported this idea! However, as our understanding of the ideal parameters of calcium sensor’s for in vivo imaging has grown, development directions have adjusted. Although we would like to measure the koff of YC2.60 and its high affinity variants such as YC-Nano15, we could not do it because it was very difficult to precisely control free Ca2+ concentration at around few tens of nM as far as we used EGTA (Kd for Ca2+ = 151 nM in 0.1 M ionic strength, pH 7.2 at 25 oC). For this purpose, much stronger Ca2+ chelator with a smaller Kd value was required. However there is no such Ca2+ chelator available now. I’m not sure why they didn’t just use the higher affinity, Mg++ insensitive, chelator BAPTA to make the Kd measurements the right way, with a linear regression of log-log fluorescence/concentration values. Due to instrument dead time, and the high affinity, I didn’t like stopped-flow based Kd measurements in the early GCaMP papers, and I don’t like them now. Also, the apparent calcium Kd will be highly dependent on solution ionic strength and [Mg++] which is unreported. Despite these quibbles, which are important only inasmuch as they give insight into the mechanism of improvement and the direction of future development, the cameleon-nano family looks promising for mammalian brain imaging. 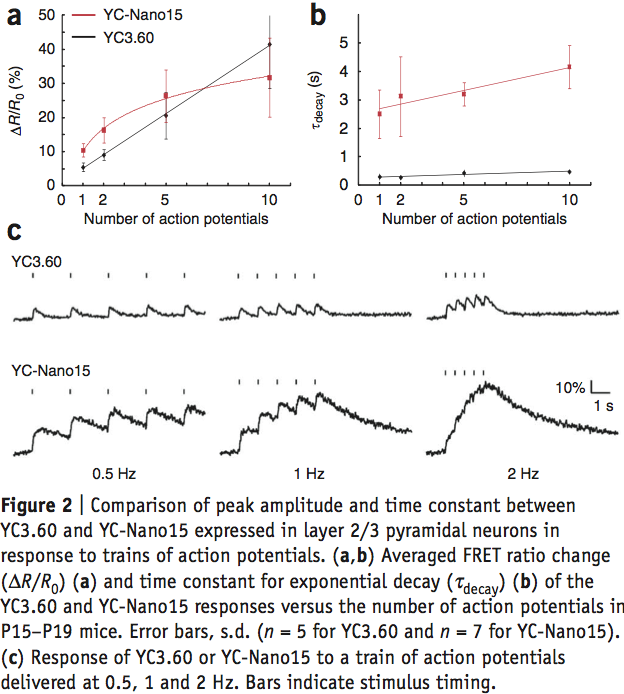 I still wonder if, assuming the reported Kd values are relevant in vivo, YC2.60 would be the best of the bunch, since cortical neurons have a resting Kd of ~50nM, which implies that a single AP transient of say 200nM free [Ca++] increase would push the calcium levels right up into the sweet-spot of YC2.60’s sensitivity. This is all the more interesting given the recent results in YC3.60 imaging from Maz Hasan’s group. Previously, he had shown that transgenic YC animals were pretty bad for imaging. However, AAV-mediated gene delivery of YC3.60 has significantly improved the responses of the YC family. 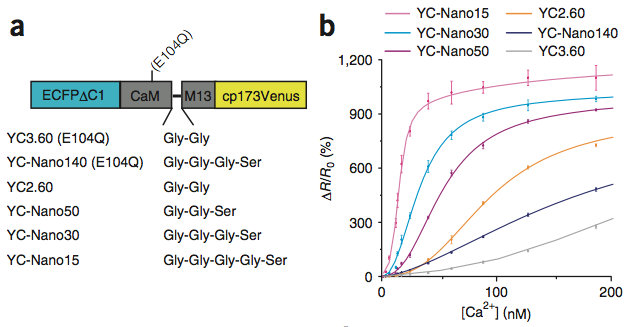 I’m not sure if they are really up to GCaMP3 levels under identical in vivo conditions, but they might have better long-term protein stability (or that might depend on which viral serotype is used.) What about cameleon-nanos, what about YC2.60? “If you find yourself needing to reread this paragraph, perhaps it’s not that well written. Or it may be that you are low on acetylcholine.” Acetylcholine (ACh) is a major modulator of brain activity in vivo and its release strongly influences attention. If we could visualize when and where ACh is released, we could more fully understand the large trial to trial variance found in many in vivo recordings of spike activity, and perhaps correlate that to attentional and behavioral states mediated by ACh transmission. Of course, the simple idea didn’t work. Instead of giving up on the first dozen attempts, they kept plugging away at alternative strategies for measuring ACh release, and eventually succeeded. 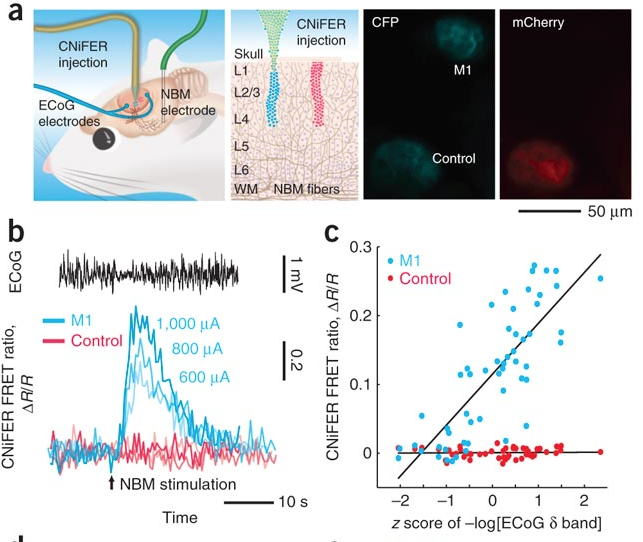 In this Nature Neuroscience report, An in vivo biosensor for neurotransmitter release and in situ receptor activity, Nguyen et al demonstrate a mammalian cell based system for optically measuring ACh levels in an intact brain. They coexpressed M1 muscarinic receptors with the genetically-encoded calcium indicator TN-XXL in HEK293 cells. ACh binding to the M1 receptor induced IP3-mediated calcium influx. This calcium rise was then picked up by the TN-XXL and reported as a change in CFP/YFP fluorescence. The crazy part is that they took this cell culture assay and implanted the cells into the brains of living rats! In culture, the response was highly sensitive and monotonic (for phasic response section, EC50 of 11 nM, a Hill coefficient of 1.9 and a maximum of ΔR/R = 1.1). In vivo, using two-photon imaging through a cortical window, they were able to see clear ACh responses in frontal cortex from electrical stimulation of the nucleus basalis magnocellularis, typically 200-μs current pulses of 200 μA @ 100Hz for 20-500ms. This was essentially a in vivo proof of principal experiment, showing that one could image ACh release in spatially and temporally precise regions of the brain. However, the imaging was done under urethane anesthesia, which is a much different brain state than an awake, behaving animal. Are CNiFERs sensitive, powerful and stable enough to determine behavioral states via imaging in an awake animal? Would expressing GCaMP3 (an indicator with greater fluorescence dynamic range) improve the performance of the CNiFER system? We used a very similar assay with ACh applied to HEK cells during the initial screens for better GCaMPs. Or, is the performance more limited by the properties of the M1 receptor and the adapting nature of IP3-mediated calcium dynamics? CNiFERS provide an interesting platform for looking at ACh and potentially other G-protein mediated signaling, but it remains to be seen if labs that aren’t as technically proficient with two-photon rig will find it more useful than cyclic voltammetry for measuring acetylcholine levels. Recently, Brain Windows mentioned the report A genetically encoded fluorescent reporter of ATP:ADP ratio. We invited Dr. Jim Berg, the lead author of the study to provide additional background to our readers. Below, Jim provides a fascinating look at rationale behind sensor development. I really like that they came at this problem with a biological question in mind, something I would recommend before anyone start the development of a genetically encoded indicator. Here’s a little insight into why we decided to develop a fluorescent sensor for cellular energy, and how Perceval evolved. One of the primary research interests of the Yellen lab is the interaction between diet and epilepsy. The ketogenic diet, a high fat, low carbohydrate regimen, is remarkably effective at reducing seizure number. We are investigating how the transition in brain metabolism from glucose to a mixture of glucose and ketone bodies (the metabolically active byproduct of fat metabolism) could lead to a change in neuronal excitability. Previously, we described how acute application of ketone bodies reduces the excitability of substantia nigra neurons, an effect that relies on the opening of ATP-sensitive potassium (KATP) channels. Our hypothesis is that the inhibition of glycolysis by ketone body metabolism leads to a reduction in sub-membrane ATP, resulting in an opening of KATP channels and a decrease in neuronal excitability. This relies on the controversial idea that sub-membrane ATP is provided by glycolysis (possibly by glycolytic enzymes tethered to the membrane), and that the diffusion of ATP is restricted between the submembrane space and bulk cytoplasm, and concept known as “compartmentation”. To fully test this hypothesis, we required an optical sensor for ATP levels. When planning these experiments, our first thought was to use Luciferase to detect different subcellular ATP levels. For a number of reasons, primarily Luciferase’s weak signal, we decided that a fluorescent sensor for ATP would be much more useful for our application. Our initial approach was a FRET-based design, with CFP and YFP tethered to a bacterial periplasmic binding protein that dimerized upon ATP application. Although these sensors gave some encouraging results, we never got the change in signal that would be required for cellular assays. We then adopted the ‘circularly permuted fluorescent protein (cpFP) approach that had previously produced sensors for calcium (pericam) and hydrogen peroxide (HyPer). We inserted the yellow fluorescent protein cpmVenus into the loop of the bacterial ATP binding protein, GlnK1 (involved in the regulation of ammonia transport) and found that application of small amounts of ATP to the purified sensor led to a substantial change in the excitation spectrum of the sensor. The affinity of the sensor for ATP was extremely high, orders of magnitude more sensitive than would be appropriate for cellular assays. We also found that our sensor responded to ADP application, only with a much smaller fluorescence change. It was then that we determined that these two perceived negatives (too high affinity and ADP binding) would lead to a sensor that reports the ratio of ATP to ADP. In a bit of good fortune, our design for an ATP sensor had in fact given us a sensor for the more valuable ATP:ADP ratio. After tinkering with our sensor by semirandom mutagenesis of the GlnK1 portion of the protein, we expressed the improved sensor, which we named Perceval (for permuted reporter of cellular energy value) into cultured cells and monitored a change in fluorescence with metabolic inhibition. Right now, we are excited to use Perceval to investigate neuronal/glial metabolism in mammals. We may target subcellular ATP by either tethering Perceval to a membrane protein, or by using TIRF microscopy. In addition, we are continuing to design improved versions of Perceval, as well as sensors for other metabolic intermediates. We also hope that these sensors will be useful in applications beyond neuronal metabolism, from studies of cancer cells to bacterial metabolism. A few months ago I threw together a short presentation on the history of calcium imaging for a journal club here at Janelia. It is incomplete. It lacks notes. It is technical. It focuses much attention on early genetically-encoded indicators. However, calcium imaging is so intertwined with the work of Roger Tsien, my Ph.D. thesis advisor, and since he just won the Nobel Prize, I thought it might be of interest to some of the audience of Brain Windows. It does provide a little bit of background for some of the more recent developments chronicled on this site. Dierk Reiff’s lab has done another head-to-head in vivo showdown between various GECIs and a synthetic dye. Their paper, Fluorescence changes of genetic calcium indicators and OGB-1 correlated with neural activity and calcium in vivo and in vitro, is very interesting and deserves a full write-up. I will present a detailed analysis of the paper in a future update. For now, check the abstract. 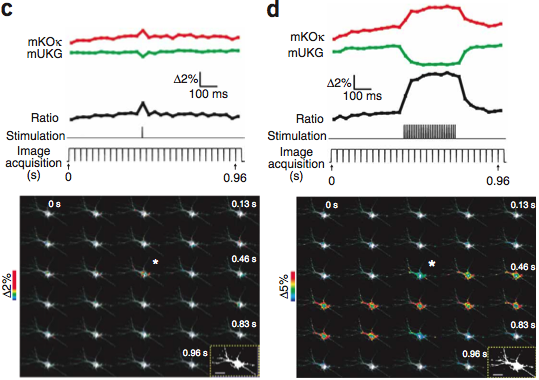 Recent advance in the design of genetically encoded calcium indicators (GECIs) has further increased their potential fordirect measurements of activity in intact neural circuits. However, a quantitative analysis of their fluorescence changes ( F) in vivo and the relationship to the underlying neural activity and changes in intracellular calcium concentration ( [Ca2+]i) has not been given. We used two-photon microscopy, microinjection of synthetic Ca2+ dyes and in vivocalibration of Oregon-Green-BAPTA-1 (OGB-1) to estimate [Ca2+]i at rest and [Ca2+]i at different action potential frequencies in presynaptic motoneuron boutons of transgenic Drosophila larvae. We calibrated F of eight different GECIs in vivo to neural activity, [Ca2+]i, and F of purified GECI protein at similar [Ca2+] in vitro. Yellow Cameleon 3.60 (YC3.60), YC2.60, D3cpv, and TN-XL exhibited twofold higher maximum F compared with YC3.3 and TN-L15 in vivo. Maximum F of GCaMP2 and GCaMP1.6 were almost identical. Small [Ca2+]i were reported best by YC3.60, D3cpv, and YC2.60. 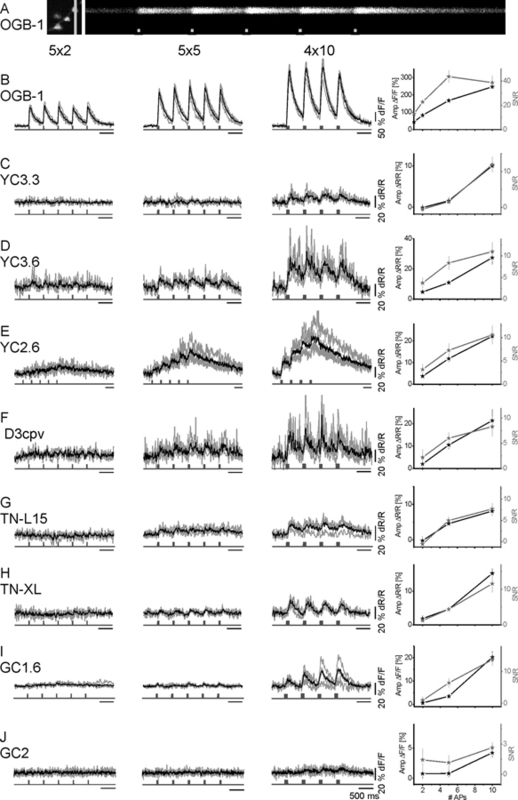 The kinetics of [Ca2+]i was massively distorted by all GECIs, with YC2.60 showing the slowest kinetics, whereas TN-XL exhibited the fastest decay. Single spikes were only reported by OGB-1; all GECIswere blind for [Ca2+]i associated with single action potentials. YC3.60 and D3cpv tentatively reported spike doublets. In vivo, the KD(dissociation constant) of all GECIs was shifted toward lower values, the Hill coefficient was changed, and the maximum F was reduced. The latter could be attributed to resting [Ca2+]i and the optical filters of the equipment. These results suggest increased sensitivity of new GECIs but still slow on rates for calcium binding. A new genetically-encoded voltage sensor paper is out from a friend and former mentor of mine, Atsushi Miyawaki. One memorable moment when working in his lab during the RIKEN summer program of 2002 was when Atsushi took me into his office and whipped out a custom green laser pointer. These had been banned in Japan, as fans would shine their powerful light into the eyes of pitchers and batters at baseball games. Atsushi was really proud of his. He smiled and then started sweeping the light point over the rocks in his fishtank. Each ‘rock’ was actually coral his lab had collected from fluorescent protein hunting trips, and each glowed a different color when the green light hit it. He has been putting these novel discoveries to good use. In Improving membrane voltage measurements using FRET with new fluorescent proteins, Tsutsui et. al take two fluorescent proteins discovered and engineered by the Miyawaki lab, mUKG and mKOk, and graft them onto the Ci-VSP scaffold used in VSFP2.1 (also developed at RIKEN). The green and orange fluorescent proteins undergo significant FRET transfer which is voltage dependent. They get 40% dR/R per 100mV with a 2 component association rate of around 10 and 200ms. Unsurprisingly, the kinetics speed up at physiological temperatures to 5-20ms on and off. They are able to pick up single pseudo-action potentials in Neuro2A cells, though the response is highly filtered. They are also able to see very clear spontaneous waves of potential change in cardiomyocytes (23% dR/R) and single spikes in cultured neurons (2% dR/R for 1AP). They dub this voltage sensor “Mermaid”. The authors state that they used the new FPs due to their improved photostability and especially pH resistance. Additionally, because Aequorea GFP variants are pH-sensitive, and neuronal activity causes considerable acidification, the responses of sensors to depolarization in intact neurons may be overwhelmed by sustained changes resulting from acidification. Granted that mOrange2 is pretty pH-sensitive, but I’m not sure this is a real issue, or a potential issue to justify using their new FPs. From the spectra of mUKG vs. EGFP, it would seem that EGFP’s 10nm further redshifted emission would be a superior FRET pair for mKOk. It smells like there may be a bit of bundling of various independent projects into this paper. However, they do make a good point that this pair will have a different preferred dipole orientation than existing FRET pairs, which could lead to improved performance in some constructs. Have they tried using the improved VSFP3.1 scaffold? This was shown to be much faster than 2.1. I suspect the mUKG is not as tolerant to C-terminal truncation than CFP and GFP. What about using EGFP as the donor? Could you then use the VSFP3.1 scaffold? Is there a rapid non-FRET quenching of the donor upon depolarization as seen in VSFP3.1? Why is the single wavelength fluorescence increasing in both channels in figure 2d? Is there some photoactivation going on? I’d love to see a head to head comparison of VSFP3.1 and Mermaid under identical conditions. Also responses in brain slice at physiological temperatures.